I love easy cookie recipes that are quick to throw together. These cookies are made with Bisquick mix, and while I was skeptical making them for the first time, they are seriously SO good! 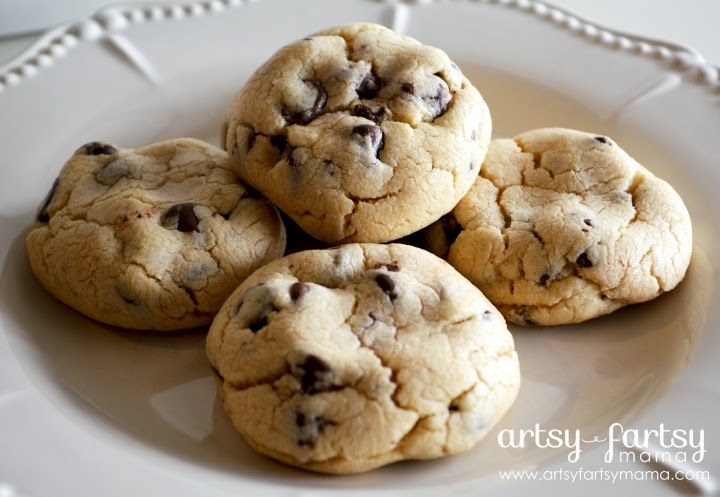 Soft, chewy, and one of the easiest chocolate chip cookie recipes I have ever made!! They are even simple enough for the kids to help make! In a large mixing bowl, combine softened butter, brown sugar, vanilla, and egg. Fold in Bisquick baking mix. Roll dough into 1 inch balls and place on an ungreased cookie sheet. Yum! My oldest LOVES to help bake, so we will definitely have to try! I've never made cookies using Bisquick. I'll have to give it a try. Lindsay what a quick and easy recipe for chocolate chip cookies! Thank you for linking up at Tasty Tuesdays! Your post has been pinned to my Recipes from Tasty Tuesday board. I can't wait to see what you link up this week!